Vale of Leven Walking Football Club had a special reason for celebration recently; the club have had a successful first year and were looking to recruit new members who can enjoy the benefits walking football brings. Football truly is for life and walking football enables the older generation to get active and involved playing football again. Add to that the club has another special historic anniversary to celebrate and Phil Dawson, who organises the group, had a great idea to combine both. In the early days of Scottish football, Vale of Leven won the Scottish FA Cup three times in succession (1877, 1878 and 1879); the cup has not been back to Alexandria for 140 years. Phil was hoping to change that fact and with the help of Walking Football Scotland Chair Gary McLaughlin and Andy Gould Head of Football Development at the Scottish FA, he managed to do it. 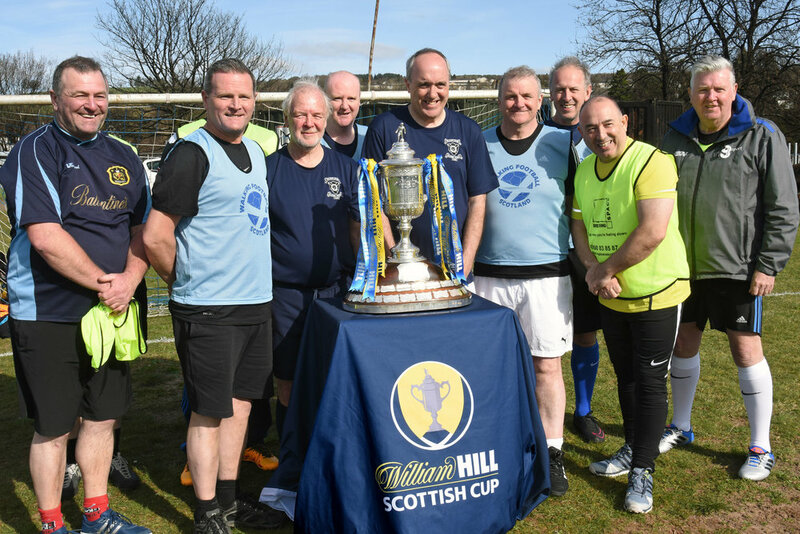 On Saturday 30th March the Scottish Cup returned to Vale of Leven as the Vale took on Muirkirk and at half-time the Walking Football Team, (one or two I am reliably informed may have played in the 1880’s), put on a display of walking football alongside the Scottish Cup. 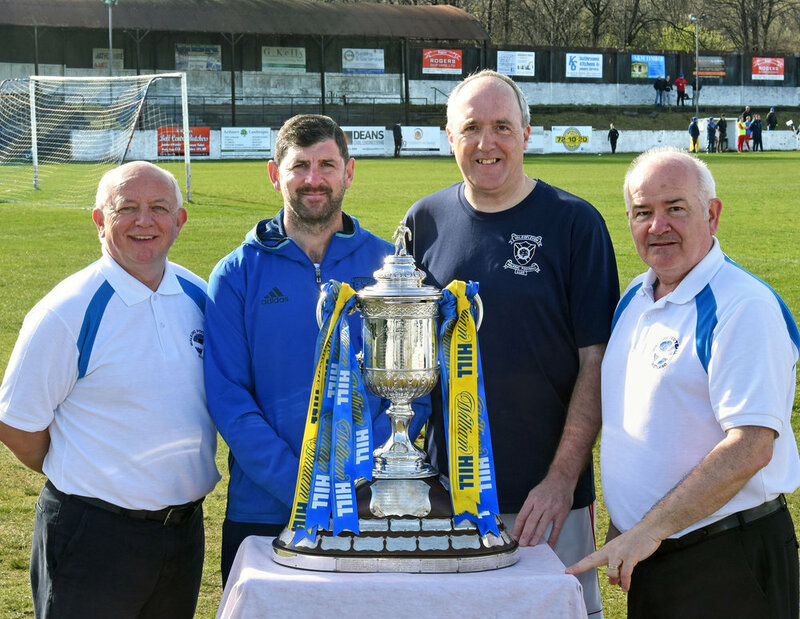 Our thanks to the Scottish FA and in particular Andy Gould for making this happen and to Alan Morgan the Central Region manager for coming along with the cup and his great support on the day. The Vale community got involved and many were photographed with the Scottish Cup and everyone enjoyed the spectacle and most of all the football. l-r Walking Football Scotland Treasurer, David Hyland, Alan Morgan, Central Region Manager, Scottish FA, Phil Dawson, Vale of Leven Walking Football Club and Gary McLaughlin, Chair of Walking Football Scotland. As we approach the 1st anniversary of the Vale of Leven Walking Football Club being formed, I thought I’d write a few words about the experience so far. In late January 2018, having travelled around the Glasgow area playing football at several different venues over the past few years, I suddenly had the idea of bringing Walking Football to the Dumbarton & Alexandria area where I live. Having spoken with my fellow committee members at Vale of Leven Football Club, it was agreed that I could use their name and so the club was formed. I then made contact with the local paper in mid February regarding an article and a two page spread went out in the paper in the last week of February, sadly this coincided with the ‘Beast from the East’ arriving and the country coming to a grinding halt, which meant very few people were interested in leaving the comfort of their own homes to join me at the local school for a kick about. The following week, having promoted the sessions through new twitter & Facebook accounts and placing posters up and around the local area the players arrived, 15 in total and everyone of them including one lady, thoroughly enjoyed themselves. Our sessions were now up & running walking. Monday nights at the Vale of Leven Academy in the Sports Hall 7.45 – 9pm. Since that date, we’ve played regularly at the School over the winter months and at Millburn Park, home of the ‘Vale of Leven Juniors’ in the summer. We have a loyal group of players but welcome any new ones who want to enjoy the banter and camaraderie that comes with being part of a football club. The highlight for most of the players has to be the Walking Football Scotland Festival which took place at Glasgow Green in June last year, the team were placed in the same group as BBC Sportsound & the Clyde Superscoreboard teams, giving us the opportunity to pit our wits against the likes of Lee McCulloch, Alex Rae, Mark Wilson & Chic Young of course & a day not to be forgotten.